The next-generation Remote Interactive Dock for the iPod, the DS-A2X, brings the iPod even closer to Onkyo's world. With the ability to accommodate video files alongside audio, the DS-A2X brings out the full potential of the latest iPod models, while delivering famed Onkyo sound quality. Through an on-screen display function that enables you to view music track lists, the RI Dock ensures easy navigation of your music via its dedicated remote control. The cradle-shaped DS-A2X, with its easy-matching black or white exterior, neatly supports the iPod and recharges it as long as the Dock remains connected to an AC power supply. It also offers a wide choice of integrated functions when connected through an Onkyo component's Remote Interactive (RI) terminal. 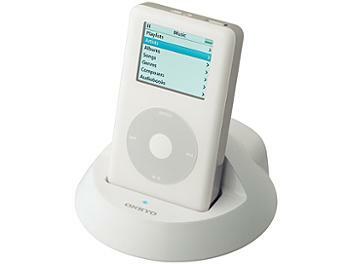 - Please note that 1st, 2nd and 3rd generation iPods are not supported. - Updating iPod software is advised before using the DS-A2X.